Autumn is now in full swing, and there is no shortage of events for people of all ages to enjoy. Check out which events are taking place around the region this weekend. Last year’s Blackwood Pumpkin Festival. Photo courtesy of Stacy Napolitano. Residents can jump into fall at the Gloucester County 4-H Fall Fest on Saturday from 4 to 9 p.m. at the 4-H Fairgrounds, 275 Bridgeton Pike, in Mullica Hill. Guests can enjoy hay rides, a haunted house, games, food, a costume contest, trick or treating and more. The cost is $10 per car. Guests are also asked to bring a non-perishable food item to receive a ticket to win a gift. For more information, visit www.gc4h.com or call (856) 307-6450, ext. 3. 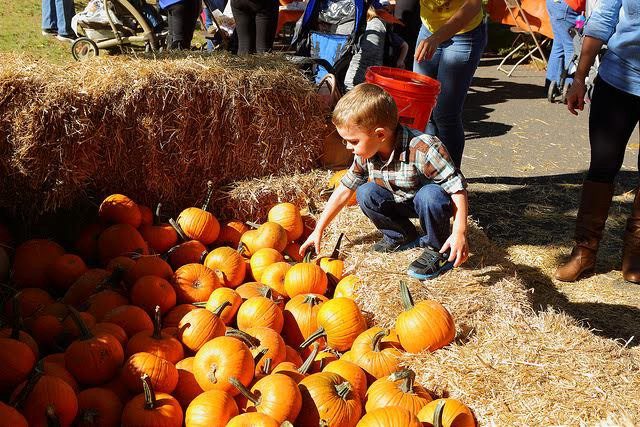 The 26th annual Blackwood Pumpkin Festival returns this weekend. The event will take place outside The Studio at Mainstage, 27 South Black Horse Pike, in Blackwood. The festival includes food, games, music, shopping among 200 vendors and four stages of entertainment. For more information, visit www.mainstage.org. Rowan College at Burlington County will host RCBC Fest to celebrate the college’s Mt. Laurel campus on Sunday. The event will take place from noon to 4 p.m. and include activities for families, an open house for future students, food, entertainment and more. For more information and to RSVP, visit www.rcbc.edu/celebration. Cherry Hill Township and Friends of Barclay Farmstead will kick off autumn with the first ever Apple Palooza. The event will take place at Barclay Farmstead on Sunday from 1 to 4 p.m. The festival will include an apple pie contest, apple stand, apple crafts, live music, games, food, tours of the Barclay Farmstead Museum and more. The event is free to attend and open to the public. Visit www.facebook.com/events/345648552536832 for more information. Sea Isle City will host Harborfest on Saturday from 11 a.m. to 4 p.m. at Marina Park, 347 42nd Place, in Sea Isle City. This festival will feature lots of delicious seafood, live music, craft and specialty vendors, nautical displays and more. Admission and parking for the event is free. For more information, visit www.seaislechamber.com. All things Italy will be celebrated in Wildwood this weekend as the Sons of Italy Wildwood hosts An Olde Time Italian Festival. The festival takes place at Fox Park, located between Burk and Montgomery Avenues in Wildwood from 5 to 11 p.m. on Friday and noon to 11 p.m. on Saturday. There will be live entertainment, delicious Italian food, vendors, games, activities and more. Admission to the festival is free. For more information, visit www.SonsOfItalyWildwood.org. Oktoberfest Live comes to Xfinity Live! in South Philadelphia on Saturday. The event will take place from 3 to 7 p.m. and include an unlimited sampling over more than 250 beers, live music, games, food trucks and more. General admission tickets are available for $45. Guests can also reserve a designated driver for $20. For more information or to purchase tickets, visit www.xfinitylive.com/entertainment/event/11398. Another festival taking place in South Philadelphia this weekend is the South Philly Sausage Fest. The festival will take over West Passyunk Avenue between South Broad Street and 15th Street from noon to 8 p.m. The festival will feature 10 diverse restaurants, 10 local craft breweries, music, vendors and a play area for kids. The festival is free to attend. Visit southphillysausagefest.com for more information.